I know, I know, Christmas is just over, and many of us probably had quite a bit if not too much of the sweet stuff. But still: nothing is better than homemade sweets. I love giving away homemadesweets as presents. They are usually much appreciated. What I like about giving away sweets is the fact that you can buy the ingredients in one shop (this is your supermarket or grocery store) and don't have to walk miles in shopping streets or malls to find an appropriate present. Another good thing is, that once you have all the ingredients at home you can make the sweets at any time of the day, be it 6am or 11pm. Another bonus of giving away sweets is, that you can always make a few more and keep them for yourself!!! Right? Right! I never really cared about the ingredients of sweet stuff. Now that I 've made a few at home, I checked the ingredients list of store-bought raw marzipan: full of stabilizers and all those E plus number ingredients. I am telling you: make it yourself. It takes no time. It doesn't need fancy ingredients. You will probably have them all at home. And they are mixed together faster than you fix your breakfast in the morning. Combine ground almonds and sugar in a food processor (using a steel blade) and process, adding just enough egg white to bind the sugar and the almonds together. Add flavoring according to your taste. Wrap the marzipan tightly in plastic wrap and keep in the fridge until it is being used. 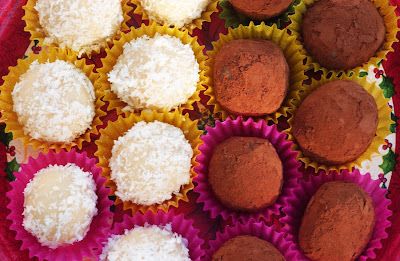 To make little marzipan confections, roll marzipan into small balls (about the size of a cherry or walnut). 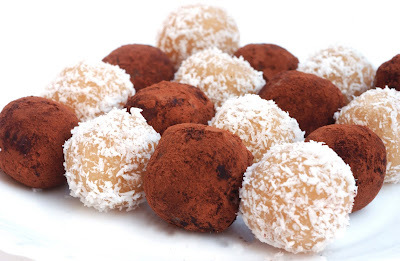 Roll the ball in your preferred coating, like cocoa powder or desiccated coconut. Place them in the smallest size paper cake cases and serve.